"Somewhere in Time" wants us to share its sweeping romantic idealism, about a love so great that it spanned the decades and violated the sanctity of time itself. But we keep getting distracted by nagging doubts, like, isn't it a little futile to travel 68 years backward into time for a one-night stand? The movie surrounds its love story with such boring mumbo jumbo about time travel that we finally just don't care. It didn't have to be that way. Last year's underrated and neglected movie "Time after Time," which had H.G. Wells and Jack the Ripper traveling forward into modern San Francisco, contained a love story that had a lot of sly fun with the notion of relationships between people of different eras. "Somewhere in Time" has a lot of qualities, but slyness and fun are not two of them. This movie drips with solemnity. It enshrines its lovers in such excessive romantic nobility that Rachmaninoff's Rhapsody plays almost every time they're on the screen. This is the kind of romance so sacred, so serious, so awesome, that you have to lower your voice in the presence of it. Romances like those are boring even to the monstrous egos usually involved in them. But back to the movie. 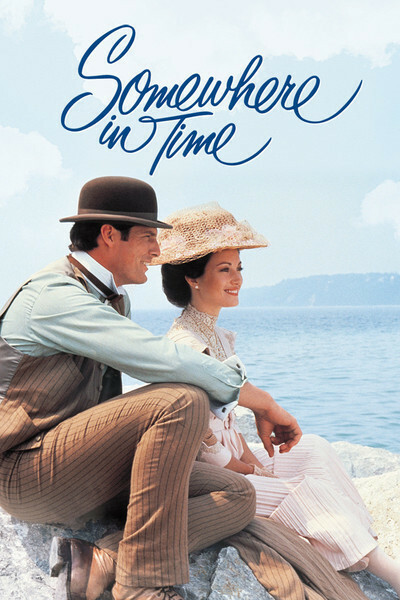 "Somewhere in Time" stars Christopher Reeve as a Chicago playwright who visits the Grand Hotel on Mackinac Island and sees a photograph there of an actress who appeared at the hotel in 1912. He is smitten; no, he is obsessed. He researches the career of the actress, falls in love with her, learns from a pseudoscientific psychology professor that time travel is possible, and hypnotizes himself to travel back to 1912. The movie never makes it clear whether the playwright actually does travel through time, or only hypnotizes himself into thinking he does. It doesn't matter. Once he's back in 1912, or thinks he is, he meets the young actress, who is played by the preternaturally beautiful Jane Seymour. "Is it ... you?" she breathes. It is! It is! A little of this goes a long way, even with Rachmaninoff. Especially with Rachmaninoff. There is, of course, a villain. He is the young actress's manager, played by Christopher Plummer. He has guided her career since she was 16, and now resents the intrusion of this stranger who has come from nowhere, is dressed oddly, and threatens to steal his protégé. There are some intrigues, as the three of them steal about the rooms and grounds of the magnificent Grand Hotel. But there are never any scenes that really deal with the romance between Reeve and Seymour -and, incredibly, the movie avoids the opportunity to exploit in their relationship the fact that Reeve is from the future. All of the delightful revelations and paradoxes that could have resulted from Reeve revealing that fact are simply ignored. This is, of course, Reeve's first movie since "Superman," and he is not particularly convincing in it. He seems a little stolid, a little ungainly; he's so desperately earnest in his love for this actress that he always seems to be squinting a little. The whole movie is so solemn, so worshipful toward its theme, that it's finally just silly.